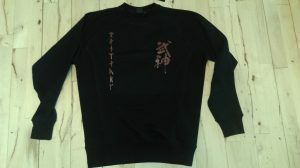 The T-shirt is designed to honor our Bujinkan Dojo Soke Dr. Masaaki Hatsumi and his kind teachings. We would like this t-shirt to remind us that the principles of life and death and peace and war are universal. Through the teachings of soke we have come to better understand our own roots from the Nordic religion, medicine and budo. Soke has often reminded us that we should also study our own fighting arts, medicine and religion from our own culture and part of the world. 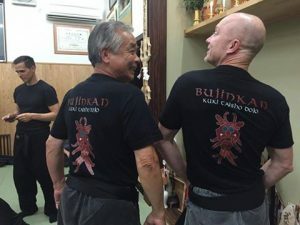 The pictures and text at the t-shirt is therefore a mix of the Japanese warrior tradition transmitted by Bujinkan Soke and our own Nordic warrior tradition of the Vikings. The reason why he was the wisest of the Nordic Gods pwas because he offered one of his eyes to be able to drink from the well of wisdom. This made him able to see all things (The eyes of God). It also made him travel freely between the nine worlds of Midgard. The mask depicted on the stone and on the back of your t-shirt is most likely the highest of the Nordic Gods Odin. The mask is probable made around the year 1000. 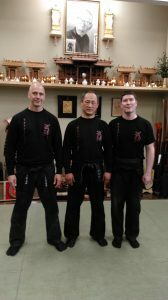 The name of our Dojo in Denmark is Bujinkan Kuki Taisho Dojo. Kuki referring to nine demons and Taisho to big laugh. We thought that Odin on this mask looks like a smiling demon and that it fitted well with our dojo. The “T” in the Rune inscription for Denmark is a drawing of the hammer of Thor. Thor is The God of Thunder from the Nordic Religion. His hammer Mjølner is a weapon of precision and can easily be hidden in even a small pocket because it can change in size. It will always hit its target and return to the hand who throws it. In this drawing you will see also a Viking upside down looking out from the handle. Thor is the God of thunder and lightning. He controls the powers of nature like the weather. He is a protector of Gods and humans and a guardian of justice and peace. 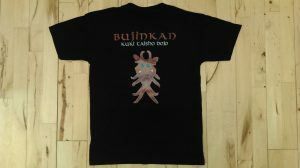 Rune inscription on the right lapel of the T-shirt is the word “Denmark” from the great Jelling Stone. The two Jelling stones are central in the Danish history and describes the first united Denmark. Runes were in the Viking Age also used to protect against evil or to cast down spells on others. 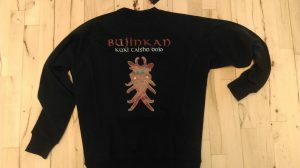 The runes on the t-shirt is thought of as a protection of your mind/heart. 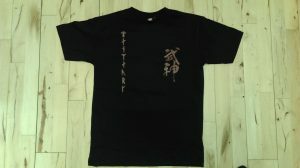 kanji on the left lapel on the t-shirt is painted by Bujinkan Soke Dr. Masaaki Hatsumi the summer of 1992. It’s meaning is “Divine Warrior” or Warrior God.